Now you can take even better pictures. The version 1.20 update for Horizon: Zero Dawn will launch next week and include new “Photo Mode” features, Sony Interactive Entertainment and Guerrilla Games announced. 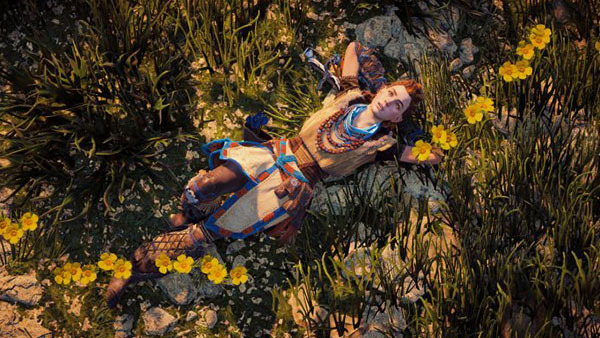 The new Photo Mode features include three new filters, the ability to show a gride, an option to add “Greetings from” to the image, and the ability to select different poses and facial expressions for Aloy, and make her look into the camera. Outside of Photo Mode, the version 1.20 update will also include a slider to adjust the camera / aim sensitivity, a Map legend where you are able to filter on icons, more HUD customization options (hide enemy stats, quest markers, and tutorial tips), the ability to hide head gear, Spanish language support to for North American copies of the game (a Spanish voice-over pack will be available via the PlayStation Store), and more. Added Spanish language support for North American copies of the game. Spanish subtitles can now be enabled, and Spanish audio is also now supported via a Spanish VO pack that can be downloaded from the North American PlayStation Store (in the week of May 8). Fixed an issue in “The Proving” where some players meant to confront Olin about his Focus during the speech, but were able to escape from the area resulting in the inability to return.